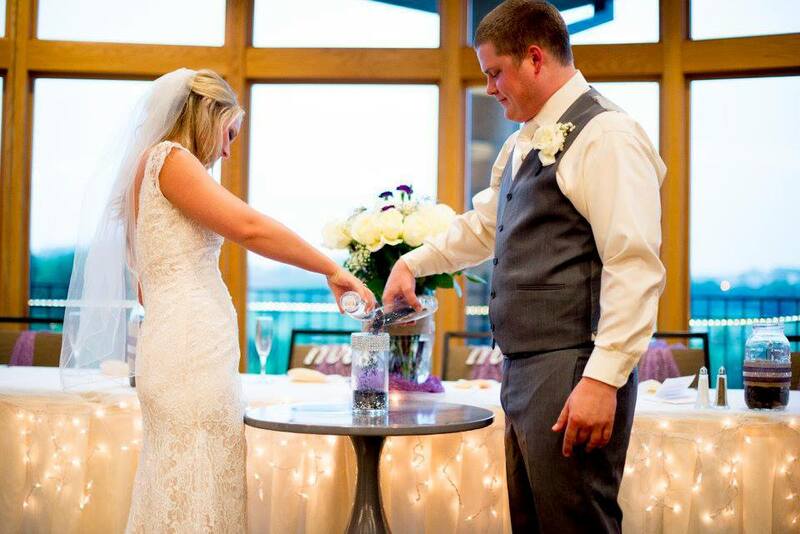 A Glass Unity Ceremony is essentially the same as a Sand Ceremony. 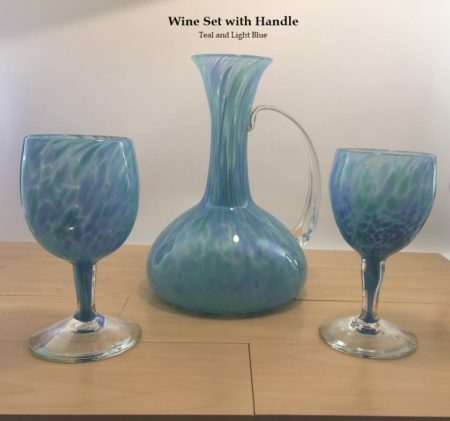 Containers are used, depending on the script chosen from those below, from which they pour their colored glass into the receptacle which symbolizes the new life being created at this moment. Glass behaves as a simple fluid when heated. It provides an infinite possibility of shapes with limitless constraints. It induces all the elements of nature; wind, water, fire and earth. The challenge is to control the movement and expansion of the shape. The couple chooses what they wish the final product to represent. Folks choose the Glass Ceremony as opposed to the Sand Ceremony because they want a more permanent memento of their wedding. Foe more detail on the process, click here to get the information. We now celebrate N. and N.’s union with a symbolic glass unity ceremony. Today the two of you are making a lasting commitment to share the rest of your lives with each other. That commitment is symbolized through the pouring of these two individual colors of glass; one that represents the bride(who now pours in some of her glass) and the other that represents the groom, (who pours some of his glass on top). Each of you comes to this relationship with unique strengths, vulnerabilities, and histories. As individuals, you are beautiful people all on your own. Yet when the two of you are blended together, you form something even more beautiful. After the ceremony is concluded the glass will be made into a final piece forever fusing the different colors together symbolizing your marriage and love for one another as inseparable as the glass becomes. Today as you make a covenant before God to join in marriage, you have chosen to symbolize that union with a glass unity ceremony. First, I will pour in white glass, representing your faith in God as the foundation of who you are as individuals. Now N., pour some of your glass, representing yourself as an individual before you came to this union. Now N., also pour some of your glass, representing yourself as an individual before you came to this union. I will then pour some more white glass, representing your faith in God as the foundation of your marriage. Then, both of you pour your remaining glass together to represent your joining as one in marriage completely and eternally. Lastly, another layer of white glass represents God watching over you and protecting you with his everlasting love. After the ceremony is concluded the glass will be made into a final piece forever fusing the different colors together. May God bless this marriage so that you are as inseparable as these this glass will become. Amen. At this time, I would like to invite__________ (children) to come forward. N. and N. have bound their lives together as a couple, but today we are also her to celebrate and acknowledge the importance of their children as they all come together to build a family. N. and N.’s individual containers of glass represent the essence of all they are and the gifts they bring to this union. I invite them to now pour some of their glass into the center vase, showing that their marriage is the foundation of this family. I now invite______________ (children) to add their glass, representing them as unique and beloved children. N. and N., would you seal the union with the remainder of your glass surrounding the children in an environment of unconditional love. 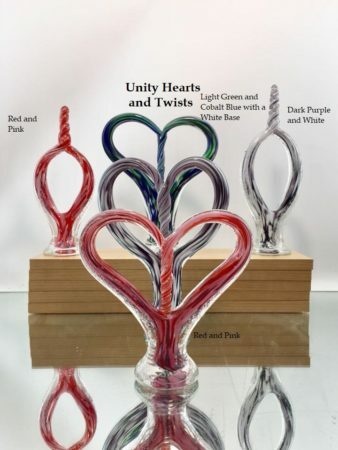 After the ceremony is concluded the glass will be made into a final piece forever fusing the different colors together symbolizing their bond of love and respect as a family that can never be separated. The Prophet has said, “You are bound together, and together you shall be forevermore. You shall be together when the white wings of death scatter your days. Aye, you shall be together in the eternal memory of God.